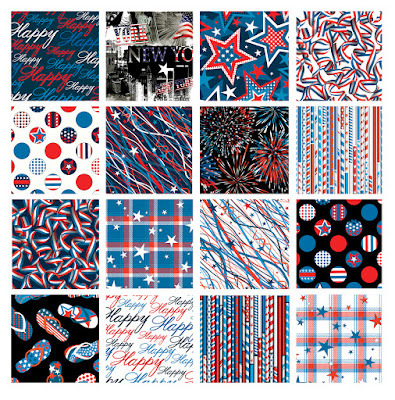 Nothing puts you in a patriotic mood like some fun red, white and blue fabrics! From stars and streamers to fireworks and flip flops, Maria Kalinowski's All American line for Kanvas takes American pride to a whole new level. Mix and match these prints with reds and blues from our Colors for Quilters solids to sew a patriotic quilt (start now and you'll be done before Memorial Day and the 4th of July!). Make a picnic quilt, placemats, or a festive door banner and get ready to celebrate! p.s. These prints are also perfect for quilts for veterans, either for a veteran in your life or for a donation to Quilts of Valor, Quilts of Honor or other organizations. Click here to see the entire All American collection.